In 1988, our owner discovered an overgrown and abused 20-acre tract of land on the Atlantic Ocean and he fought overzealous developers in their scheme to erect a 200-unit condominium complex. Two years later, he acquired the property and transformed it into a picturesque, environmentally friendly South Seas style resort called The Moorings Village. THE MOORINGS VILLAGE The Moorings Village opened in 1992 without fanfare. Consisting of 18 villas, conch houses, cottages, and plantation houses on a velvety white sand beach and set amidst 600 coconut palms punctuated with lazy hammocks; The Moorings Village became a "must see" for travelers seeking paradise. Discovered shortly after by legendary photographer Bruce Weber, The Moorings Village became the hottest tropical location site in the U.S. It has adorned the covers of Vogue, Elle, and Sports Illustrated swimsuit editions, along with numerous movies, ad campaigns, and catalogs whose clients include Ralph Lauren, J. Crew, Victoria's Secret, Abercrombie and Fitch, Versace, Guess?, and BMW. MORADA BAY BEACH CAFÃ‰ In March 1997, the Morada Bay Beach CafÃ© opened, offering guests a beautiful sunset view from bayside tables, a casual surfing and sailboard interior and an eclectic bistro style menu. Created to evoke the feel of a beach cafÃ© where the Hawaiian and Californian surfers and sailboarders would relax after a day on the water, The CafÃ© is an outdoor Mediterranean bistro set in the sand, with inside and outside bars, unique live entertainment, a large child-friendly beach with giant Adirondack chairs, and renowned Full-Moon Parties monthly. PIERRE'S RESTAURANT In July 1999, Pierre's Restaurant, was opened. Very much like the Moorings Village across the road, the restaurant's exterior resembles the old colonial style residences found in West Africa, but its interior reflects different cultures from around the world. Pierre's Restaurant is a sparkling white two story plantation house with blue shutters encompassing 140 seats, with 90 indoors and 50 on an outside veranda facing the Florida Bay and breath-taking sunsets. The downstairs features The Green Flash Lounge with its beautiful mahogany bar, leather chesterfield sofas, comfortable beige banquettes and rattan chairs. 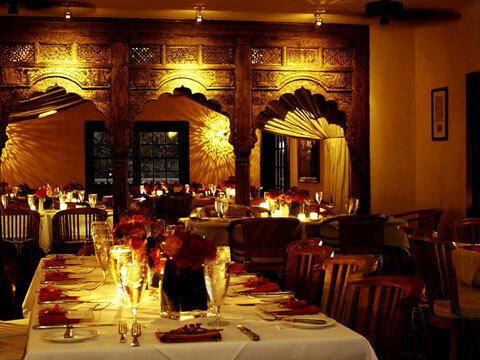 Both the lounge and the upstairs dining room feature dark planked wood floors, an eighteenth century Indian arcade, natural textured walls, and smooth teak tables on kilim rugs, surrounded by Moroccan, Indian, and African artifacts. Each entryway highlights a nineteenth century richly carved monastery door from India. Carved walls, Moroccan lamps, and banquettes strewn with colorful pillows create a romantic setting. MORADA BAY BEACH CAFÃ‰ Morada Bay Beach CafÃ© & Bar is an outdoor Mediterranean bistro cafÃ© set in the sand, with inside and outside bars, live unique entertainment, spectacular sunsets, and a large child-friendly beach with giant Adirondack chairs. The CafÃ© will accommodate a maximum of 200 guests for outdoor dining. The CafÃ© does not take reservations, and is open 7 days from 11:30 am. For more information, call 305.664.0604. PIERRE'S RESTAURANT An upscale restaurant, Pierre's combines fine dining with an "elegant but easy" ambiance that is unrivaled in the Florida Keys, and indeed, South Florida. Offering a "phenomenal" menu of French Fusion cuisine with World influences, Pierre's also presents nightly specials featuring the finest in fresh-caught local seafood. In combination with its extraordinary atmosphere, Pierre's represents "one of the top all-around dining experiences" in the islands. THE MOORINGS VILLAGE Situated in the heart of Islamorada; halfway between Miami and Key West, The Moorings Village is an 18-acre property harboring 18 cottages and homes on what was once a coconut plantation. Ranging from one to three bedrooms, each residence is self-sufficient with its own well-equipped kitchen, television, telephone, and, in most cases, a washer and dryer. Life at The Moorings Village is quiet and simple. Guests can do a lot, or if you choose, nothing at all. Personal housekeeping services can be arranged through the office for a nominal fee. Room service is not available. By staying at The Moorings Village, guests get an honest taste of what life is about in the laid-back American Caribbean Islands called The Florida Keys.